When we picture the perfect complexion, we often look towards the tanned, glowing skin of the celebrities in magazines (who are usually lazing about on a yacht in the Mediterranean). It is so tempting to think “All I have to do is sun bake and I will look just like a Kardashian!” but please take it from me – DON’T DO IT! Especially in Australia! 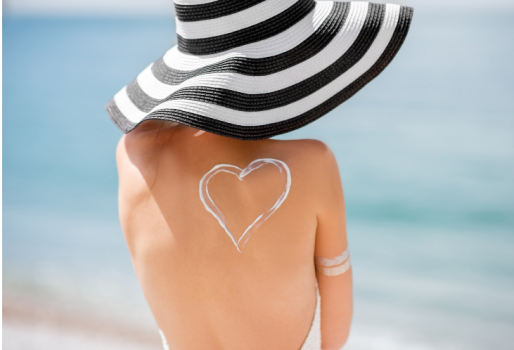 The dangers of excessive sun and UV damage are well known, skin cancer is our “national cancer” with a staggering amount of people, young and old, being diagnosed every day. Tanning beds or “solariums” have now been banned in a number of states and territories because of the danger caused by UV rays. Along with the risk of cancer, sun and UV damage is also a leading cause of premature ageing, causing pigment spots (hyper- and hypo-pigment), wrinkles and fine lines. Whatever your main concern, sun protection must be an integral part of your daily skin routine. So will any sunscreen do? Or is there a particular one I should look for? WELL some modern sunscreens are formulated with a variety of chemicals and nano-particles which may have potential side affects such as hormone imbalances in the body. The most common ingredients to look out for (and avoid) are oxybenzone and Octylmethoxycinnamate. These chemicals work as absorbent sunscreens. They protect your skin via “absorbing”the sun’s rays before they get a chance to do any damage. However these particles have a low molecular weight, which allows easy absorbtion into the blood stream, and the jury is still out on the exact long term effects of these chemicals on the body. Being aware of these ingredients and knowing what to avoid will make it easier to find a sunscreen that not only works, but is safe for the whole family. What ingredients should I look for then? You want to look for a sunscreen which has protection from UVA and UVB rays, and has macro-particles instead of micro-particles (macro = big.) In other words, you want a mineral sunscreen which offers a barrier protection rather than an absorbing one. Zinc Oxide and Titanium Oxide provide an excellent barrier protection (This is the same ingredient in the pink stuff Mum used to put on your nose at the beach). Luckily, zinc isn’t naturally fluro pink and can be found in a variety of forms, just make sure your sunscreen has at least 20% which will give you a 30+ protection. A great one for summer is Dermaceutic K-Ceutic (RRP. $79.80) which has a non-greasy texture and 50+ protection. But remember: The best sun protection comes from combining your sunscreen with a long sleeve shirt, a wide brimmed hat, and sunnies! Stay cool everyone – and don’t forget to hydrate!